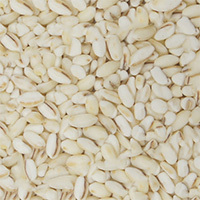 Whole grain barley or simply barley grain looks almost like rice but in fact is just a by-product of barley. It is not that uncommon to mix rice with barley grains when cooking rice. Grain barley is said to help with controlling blood sugar levels mainly due to the fact that it contains resistant starch making it low GI. The calories in Whole Grain Barley per 30g(1serving) is 103 calories. Whole Grain Barley is calculated to be 343Cal per 100 grams making 80Cal equivalent to 23.32g with 22.86g of mostly carbohydrates、2.1g of protein、0.63g of fat in 30g while being rich in vitamins and minerals such as Copper and Molybdenum.